The term “Gasoline Alley” comes from a comic strip created by Frank King and first published on Nov. 24, 1918, in The Chicago Tribune. Its main characters, Walt, Doc, Avery and Bill, had ongoing conversations about automobiles. The comic strip inspired the use of its title when several filling stations appeared in close proximity. Carleton Road in Hillsdale became a Hillsdale County gasoline alley. Getting gas for your car was a vastly different experience in the early decades of the 20th century than it is today. The customer pulled up to the pump and sat there like royalty as an attendant filled the car’s gas tank. That process was quite a production. The gasoline pumps had a glass globe on top with a gravity feed. After the customer told the attendant how much gas he wanted, the attendant pushed and pulled the crank on the pump to draw gas into the globe until it reached the line that matched the number of gallons desired. Then a hose attached to the globe was placed in the car’s gas tank and gravity did the rest. By the 1950s, when this picture was taken, a mechanized pressure pump inside the pump made getting gas easier, but attendants continued to fill the tank, check the oil level and wash the windows. There were rarely more than two pumps at the station, while each station had one to three service bays, and the small showroom/office offered oil and accessories for sale. Not even close to the convenience stores that we find today at gas stations, things available for sale were limited to tobacco products, candy bars, and a ice-filled cooler of coke and Nehi beverages. Service stations were a masculine retreat. Many men with time on their hands would stop by to shoot the breeze. With women customers tucked away in their cars, there was no interference with the light conversation and good mood enjoyed by the guys inside the office. As it was for Walt, Doc, Avery and Bill in the comic strip, the filling station was a congenial and relaxing social club … and it was absolutely free. The Gold Bond Gas Station was located on what is now Carleton Road in Hillsdale, where Market House was later located, and was owned by Clayton “Stub” Freese and wife, Margaret. The station was destroyed by fire in 1941 when a tanker overflowed. A sure sign of how long ago the Gold Bond Gas Station existed was the price of gasoline at the time: $1.04 for eight gallons. 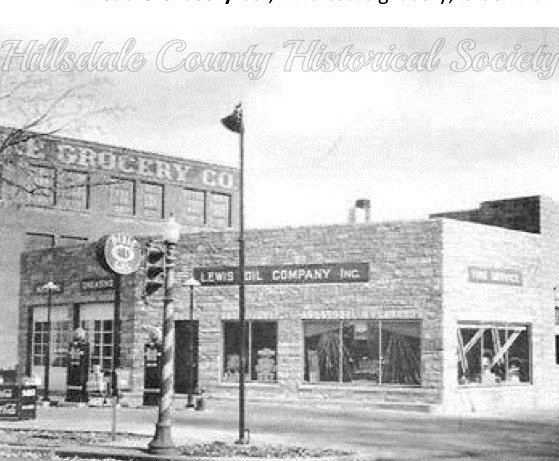 What started as a small machine shop with an early gasoline filling station by the Bentz brothers later turned into a large operation on Broad Street, south of the post office in Hillsdale. This convenient little gasoline station south of North Adams, where Knowles meets Hoxie going east and State going west, became an obstacle to faster cars in later years. Numerous accidents and at least three fatalities occurred here through the years. Today the little patch of ground sits vacant. In the late 1920s, it seemed houses were being torn down by the dozens and service stations were popping up on every other corner. 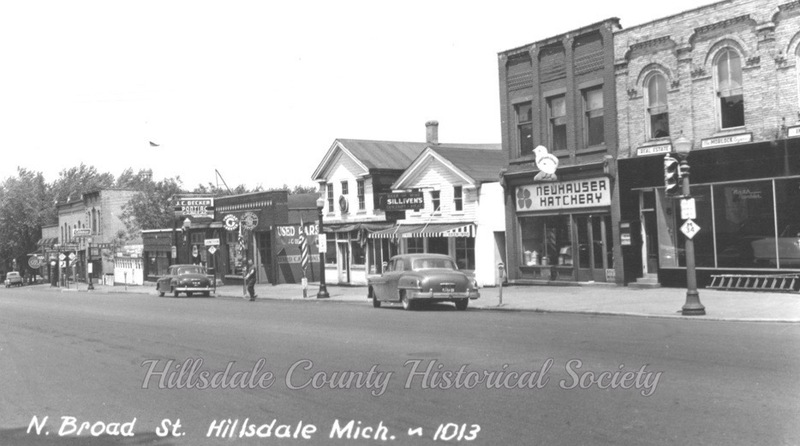 This particular Standard Oil station replaced a house on the northwest corner of Howell and Barry streets in Hillsdale, then later was replaced by a savings and loan. The Bates Oil Company on the corner of Howell and Sharp streets. the same block on broad street a little later. The gulf station on the far corner (north), then Hill piston, with decker pontiac cadillac in the middle of the block. Binder Motor sales was later on the corner to the right.